"Funny thing is, I don't remember putting half of this together. I'm sure he started out as a little water-yacht for my retirement." A mad professor tap-dancing in the body of an even madder woman, Runcible is less of a person and more a cocktail of chemicals (mostly alcoholic) of the sort one might observe rumbling away in the belly of a white dwarf just before it decides to do something "super". Where she came from is a mystery to almost everyone, including Runcible herself, who long ago replaced most of her brain cells with tiny robotic parasites to help her solve the Times crossword. Madder than a box of cats whose rent cheque just bounced, the Professor spends her days actualising the nonsensical ideas whizzing around her head, which usually turn out to be some sort of faulty toaster, or perhaps a planet-devouring eldritch beast, which she might keep in a hamster ball and call "Ronald". 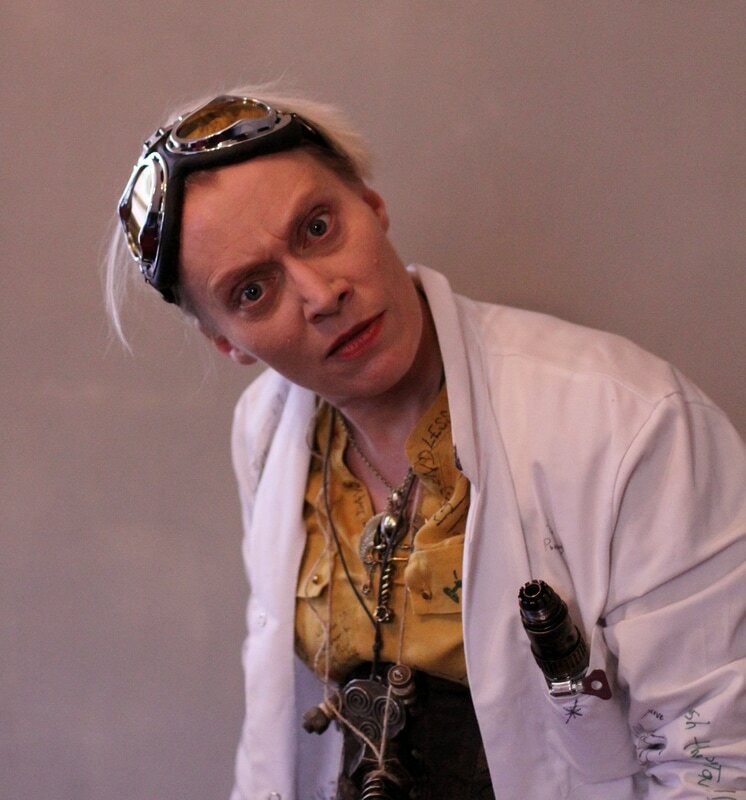 The maddened, intoxicated and downright bizarre Runcible is the resident professor aboard the Jolly Good, which she fashioned in a bleary haze of inspiration and cosmic transcendence. 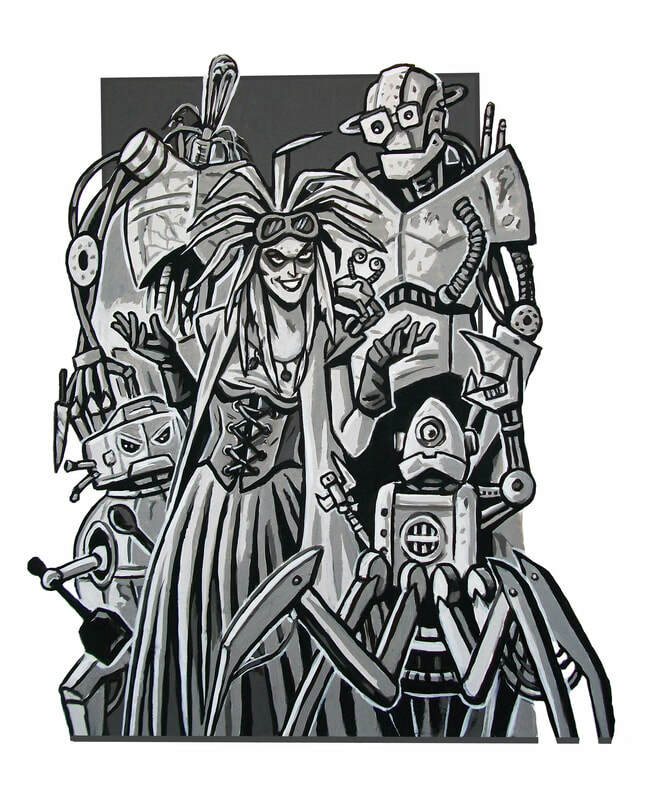 Creator of a thousand-and-one deranged gizmos, Runcible is perhaps the only one who might know how the Jolly Good actually runs—except her insane experiments could well blow the ship into the next universe at a moment's notice. She is the creator and owner of Dashworth's rocket ship, although for the life of her cannot remember how exactly she put the impossible craft together. All she knows for certain is the curtains in the Engine Room were Valerie's idea. Carries an egg in her pocket, just in case. As Professor Emeritus of the Royal Academy of Scotland, Runcible exasperated the school board by proving herself smarter than gravity, and was kicked out down the academy steps. She would return to construct a bizarre rocket ship outside her old academic haunt, and berthed it in London where it became the subject of ghost stories. While the rest of the Jolly Good's vagabond crew set about celebrating Christmas in their own inimical ways, Runcible awoke with the furious urge to slaughter everyone aboard and take her magnificent vessel into the far reaches of the cosmos. Dogged by a powerful drive to follow the seasonal celestial alignment, Runcible set her menagerie of murderbots on Gwen and Benson in a bid to make sense of her eternally confused mental state.